I'm gonna offer the choice: do you want an empty life, or a meaningful death? Prologue’s rambunctious main-on-end titles for Iron Man 3 ably encompass three movies' worth of Tony Stark Adventures™ in a montage as happy-go-lucky and over-the-top as the armor-clad superhero himself. 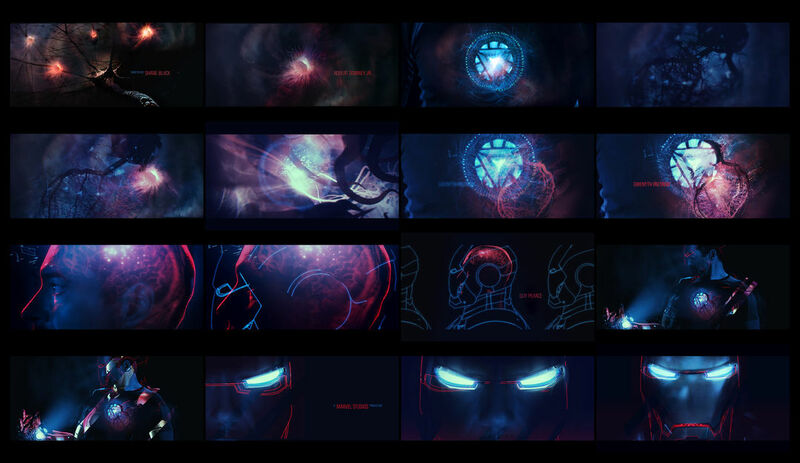 Interlocking angled transitions and perfectly timed freeze-frames bring the Marvel cinematic universe ever so briefly back to the pages and panels that first spawned it. Accompanied by Brian Tyler’s jazzy, Lalo Schifrin-esque closing track “Can You Dig It,” a cast of comic book characters are given their due one campy ’70s TV-style action shot at a time. A discussion with Creative Director DANNY YOUNT. This is your third Iron Man film. How has it been working on this series? I guess I have a history of doing titles for Robert Downey, Jr. films – like Sherlock Holmes – and I always look forward to working with Kevin Feige and Victoria Alonso and the directors they choose. But this one was extra special for me in that I was able to work with Director Shane Black, whom I did titles for back in 2004 for a movie he wrote and directed called Kiss Kiss Bang Bang. It was one of the films Robert Downey, Jr. did right before he became an action hero. How was it to be reunited with Director Shane Black after your previous collaboration on Kiss Kiss Bang Bang? Wonderful! For me it was one of those full circle kind of experiences. I never met Shane until this film. 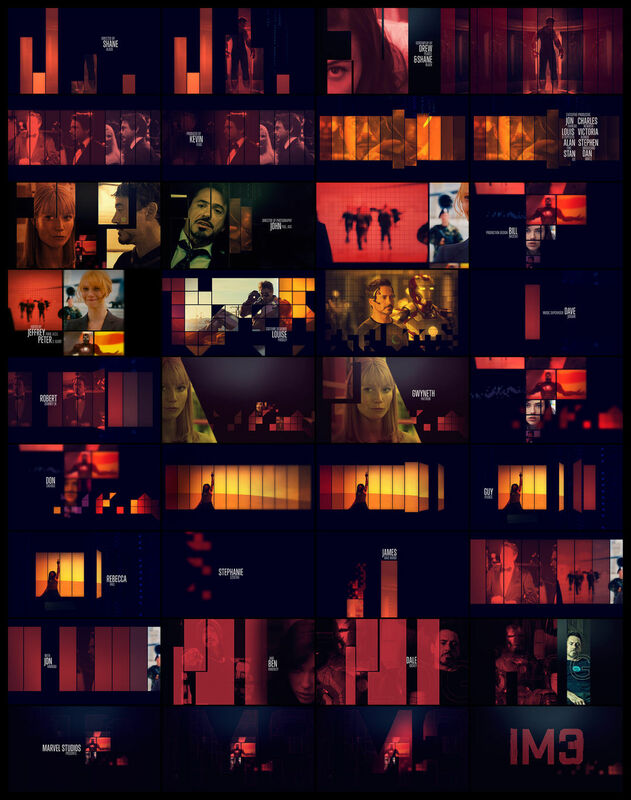 When I did Kiss Kiss Bang Bang I would meet with Producer Joel Silver, who has a real appreciation for good design. As good as that experience was, I always wondered what it would be like to work with Shane. In person he seemed very down to earth. We started talking about the titles for Iron Man 3 one morning and the subject of Kiss Kiss Bang Bang came up. He was very complimentary of the work I did for it. And I was of him – I think he's a great writer. What are some differences in working with Directors Jon Favreau and Shane Black? Everyone has their own working style but both are equally gifted, in my opinion. One thing about Favreau is his ability to clearly articulate all the details. He has a very sophisticated perspective and is a great communicator, which was important with all the crazy work we did on the hologram interfaces in Iron Man 2. Plus, like Shane, he's a very nice guy and good collaborator. Both of them are very secure in who they are as filmmakers which always makes everything easy. 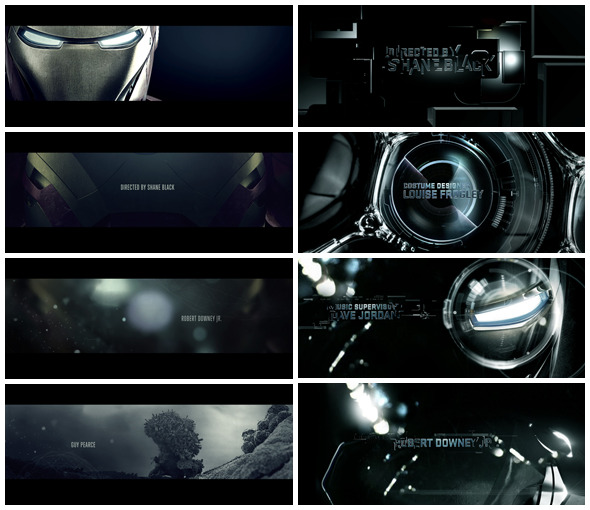 Could you tell us about the original concepts for the title sequence and how they were developed? The first presentation I did with Ilya Abulhanov was very rigid and technically ambitious, but Kevin and Shane wanted none of that! They were more open to ideas that were a little wacked out and fun, like one edit that Kyle Cooper made of Iron Man doing a striptease in his removable suit, haha. So that began a conversation with him and Kevin of what they wanted. This concept explores the science behind the suit - handed down from Tony''s father and perfected by Tony himself. At the core of this design exploration are visuals representing a series of tests in what appears to be various interfaces and archival material shot macro. Within this framework there are 2 parallel streams- the science data collected by Tony's father (used by Tony as reference) and the trials and triumphs of Tony's own explorations. This visual compilation appears to occur over several periods of time- from early studies of stress tests and jet propulsion to nuclear fission and nanotechnology- to ultimately the holy grail of the blending of neuroscience and biologically responsive hardware. Designed by Ilya Abulhanov and Danny Yount. Where did you get the idea for the energetic split screens and angled transitions? Shane is open to retro things – as evidenced in Kiss Kiss Bang Bang – so he wanted something kind of like an old film title... like Pablo Ferro's Bullitt titles. And I'm a product of the ’70s and ’80s so I love old TV crime drama titles like The Dukes of Hazard and Get Smart. I’m also a huge fan of the classic comedies like Airplane! and The Naked Gun, which to me are all about taking a very serious subject and finding the right way to make it extremely unserious. So I made a test edit or animation of the titles using the Iron Man 1 and 2 show footage and stuff I found in the current trailers running for 3. I wanted the animation to be almost overpowering and ridiculous, so I went for the most clichéd move I could possibly think of. In the test I used the music from an old show called The Mod Squad, which was the cool show to watch back then. Now, the music is so campy that it’s hilarious. Everyone seemed delighted by the tone and the comedic moments found in unexpected freeze-frames. But the ’70s vibe was a little heavy-handed for them so we ended up somewhere in the ’90s, with drop-shadowed type and TV-like wipes and split screens. The color freezes are about the only ’70s aspect of the style but it seems to work well overall. One of the designers made an angled wipe which I liked a lot, so I wanted most of it to have that. I pretty much just went through each film and found what I thought were the best scenes. We then categorized them into action scenes and lifestyle scenes. Then, we sub-categorized them editorially into match cut moments, like every time Tony Stark or Iron Man uses a certain trick or every explosion or every time you see beautiful women or cars. After all, it's entertainment so it has to be pure fun! Was the music written before the sequence was started, or after you’d done your work? No music was made until after the idea was accepted. And the audio that most editors chose did not at first have the same cool vibe as the Mod Squad music. The tone is all-important or it does not work. What's great about the Mod Squad piece is the horns section – it's almost monotonous which makes it funny. But the final piece scored by Brian Tyler seemed to work perfectly. In this approach we see the process of Tony's body coming back to life and the nanotechnology in his body communicating with the suit as he is revived by it. Color in this concept provides a way to delineate between man, machine, and energy. A beat of black is interrupted by brief, crimson flickers of light that fly in from behind camera. The pulses of light trace tree-like synapses in the brain. There is an echo of blued data behind them. Then black again and then a few, violent pulses of red light, backlit tissues in the nervous system, arteries, then heart. The chest apparatus illuminates- jolting the heart into action. What ensues is a light show of the body reviving and the suit communicating with its organic biotechnology. Glitchy reveals of the suit, Tony Stark inside it, and the wireframe hologram of the suit traces back and forth until he is fully charged. Cut to a wide shot of his body is space, first motionless, then powered up and soaring, wiping the screen to white. 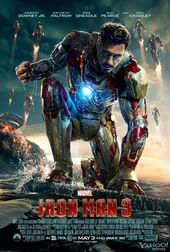 Why is “Iron Man Three” spelled out at the end? Kevin saw it on the web somewhere being used as sort of a South Park-style visual pun and he liked it. I thought it was a fun choice. I love how open he is to things like that. I wanted the animation to be almost overpowering and ridiculous, so I went for the most clichéd move I could possibly think of: the mighty trailer-style camera track through type. Without another creative outlet it is easy to become disillusioned in this business – you often give more than you get back. When you start taking it less seriously, it stays fresh. I wanted the color to feel cheap but they wanted it to be film-accurate so we had to pull back on that. I also wanted more campiness and ’70s style tonally but that would have stepped on the film footage too much. For the previous films Prologue has handled more than just the title design. Was it the same this time around? Yes, we were asked to do some UI design - Tony Stark's hologram phone and screens that use a database and track the President on Air Force One. 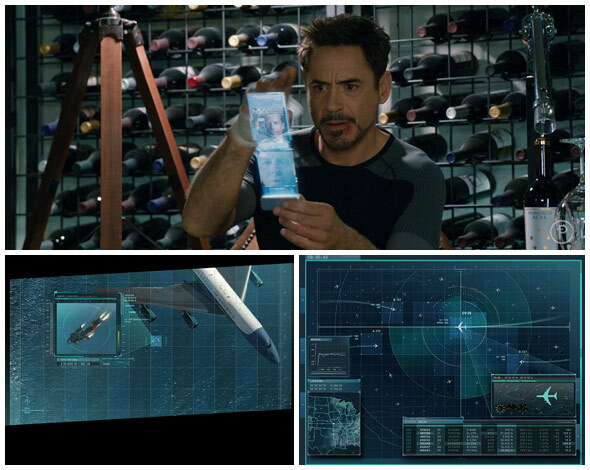 For the phone, there's a scene when Tony kind of "flicks" the information above the practical base he is holding. His eyeline was a little high so I made a UI that unfolded information vertically above the device to reveal the Aldrich Killian's dossier. I wanted the look of it to not be too far out in terms of product development from the established design of all the holograms we had created in 2, so I began with that and went from there. Ilya Abulhanov and team then animated the sequence. Another team at Prologue animated 2 other graphic UI sequences designed by Nadio Tzuo - the screens in the news van while Tony was stuck in Tennesee, and the tracking screens that zero in on Air Force One. Which tools did you use to put it all together and how big was your team? The usual Adobe tools and GenArts Sapphire plug-ins. The 3D conversion was done in Autodesk Flame. The production team was six to eight people. This concept was included in Prologue's second round of presentations for the Main-on-End titles and it makes a distinct departure from their earlier more technical designs. Director Shane Black wanted more of a retro film title feel- screen wipes and split screens lend an overall 70s feel that really comes across the in the final Main-on-End title. What did you enjoy most about working on this sequence? That it was not an over-complicated or messy assignment! Good things happen when you feel like you can breathe creatively. It was also good to work with the same people again and see some familiar faces. You recently left Prologue. What were your reasons for leaving the company at this stage in your career? I've been at Prologue longer than any company I have ever worked at – more than eight years, which in this business is almost unheard of! I just needed a break from the routine and wanted to see what else is going on. I also wanted to be able to do other things like the Semi-Permanent titles, which I would not have been able to do otherwise. I don't have any huge plans right now. I'm just going where good work leads me. So far I have had no shortage of work. What kind of advice would you give someone starting out in title design specifically? It's hard work and long hours so be sure it's something you are passionate about. Also, broaden your focus, because titles do not make a lot of money. You have to pay the bills with other kinds of work like VFX or commercials or broadcast design. Part of me wishes that there was such a category. I think titles are an underappreciated art form that is essential to film. But the other side of me wonders if the politics that often drive things like getting an award would take the fun out of it. What continues to excite you outside of the design world? Travel. I love seeing how the rest of the world lives – it really influences design and gives me perspective. My first big experience like that was the time I was sent to Prague for nine days to shoot a commercial. It totally blew my mind to see the real thing – Prague was the center of Europe in the old world – instead of some cheap replication or picture in an art history book. Also, my family. If things are not good at home, they will not be good at work. My two sons Kyle and Jacob never cease to amaze me and my wife Vicki has the patience of a true saint. Any spouse in the motion business knows what I’m talking about! I also play guitar on weekends occasionally with some pro musicians. That inspires me a lot and helps me to grow. Without another creative outlet it is easy to become disillusioned in this business – you often give more than you get back. When you start taking it less seriously, it stays fresh. A 3D object-based particle plug-in for After Effects with a fast Open GL 3D rendering engine.